IPC Eagle CT40 Scrubber -Brush Drive w/Pad Driver, 145AH,OBC | Kerr Paper & Supply, Inc.
High quality/high performance vacuum motor. Great maneuverability due to optimum weight distribution. Easy to use control panel. The CT40's exclusive squeegee system assures high performance. Solution control with automatic stop saves water and chemicals. The vacuum motor is mounted in the highest part of the machine and is protected by a filter and water level sensor. 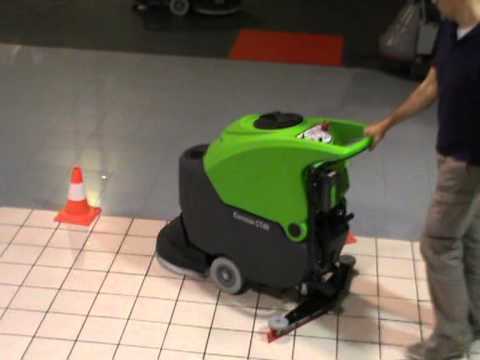 Brush control with automatic delayed stop saves brush wear and protects the floor surface. Recovery tank can be tilted. CFS (Center Flow System) Solution distribution from brush center. CWS (Constant Weight System) ensures maximum scrubbing results. High quality/high performance vacuum motor. AFS (Anti Foam System) and shut off sensor protect vacuum. Spin-on spin-off brush/pad driver (single brush only). Empty Weight Without Battery: 183 lbs.